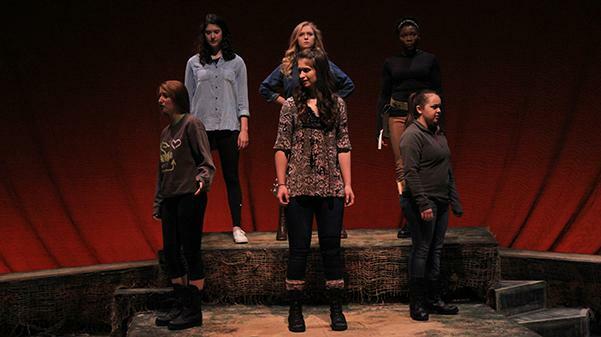 The six women of ‘A Piece of My Heart’ are on stage in the Emerson Black Box Theater during a scene in which the characters see all the injured soldiers around them. The fourth wall will be shattered in the Emerson Black Box Theater when the docu-drama “A Piece of My Heart” opens Thursday. Graduate directing student Rosalia Portillo said she picked this show for her second-year project because she has “always been drawn to history” and what people can learn from it. “I really love pieces that leave people talking,” Portillo said. “A Piece of My Heart” is a play written by Shirley Lauro based on the book “A Piece of My Heart: The Stories of 26 American Women Who Served in Vietnam,” by Keith Walker. The six female characters of the play are inspired by stories from the novel. Alexis Baker gazes off stage as she speaks about her war experiences. Freshman acting major Alison Arana, who is performing in her first show at Lindenwood, had an enlightening experience after reading the book and finding the woman her character Whitney, a Red Cross volunteer, was inspired by. “I think from that point moving forward after I found her was just trying to do as much justice to what she went through and respecting everything that happened to her,” Arana said. Bickel, who is a head nurse in the play, agreed. Portillo said the documentary feel of the show comes from monologues, explanations of the events and the breaking of the fourth wall, where the actors talk and act directly to the audience. She said “fragmented” is an adjective to describe the show because it is experienced as a memory showing time before, during and after the Vietnam War located both in Vietnam and in the U.S. Freshman Alison Arana (left), Patience Davis (right), Alexis Baker (back left) and Jenah Bickel (back right) in a rehearsal on Jan. 28 in the Emerson Black Box Theater during an attack scene. “It’s these women while looking back, working through it in time; there’s a lot of layers to it,” Portillo said. Bickel said more than anything, the play is about the women’s journeys and how they come out of it. “It’s just that progress of each character and the difference of them in the very beginning of the show and at the very end,” she said. To balance the seriousness, Portillo said there also will be some funny moments. What Portillo hopes from the show is to help people understand and appreciate women’s roles in Vietnam and for it to be an educational experience. “I think it will be great for the audience to walk away having learned something and also creating interest in not just this big idea of war, but the people who serve and how it impacts them, for the good and the bad and in between,” she said. Additionally, Portillo hopes the play will show the importance to respect those who served and caring for other people’s stories in general. 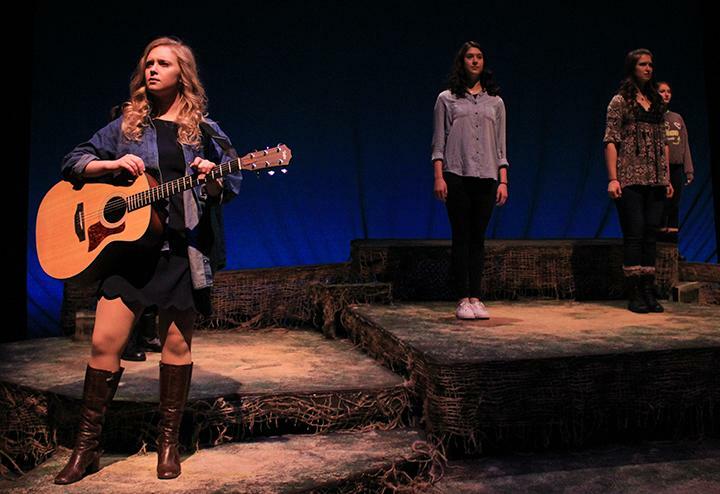 “A Piece of My Heart” runs in the Emerson Black Box Theater at the J. Scheidegger Center from Feb. 2 to Feb. 4 at 7:30 p.m. The show is a free, non-ticketed event.